An experienced and passionate freelance writer and editor of cookery and illustrated lifestyle books who utilises strong organisational and editorial skills to manage a challenging list of titles, consistently bringing beautiful books in on budget and within deadline, while maintaining the highest editorial standards. Now with over ten years’ experience working on cookery titles with some of the world’s best chefs and home cooks, and looking for new and exciting challenges within this field. As well as editing and project management, I have also ghostwritten several cookery titles and worked with chefs to develop their recipes for the home kitchen. * Working as a freelance project editor for a variety of publishers. Overseeing all aspects of producing the book before delivering final files to the publisher. Managing design, photography and editorial and liaising between the publisher and freelance team to ensure the best possible finished product. * Pitching possible book ideas and authors to publishers and working up synopses and presentations for book fairs and internal sales meetings. * Working side-by-side with chefs to shape manuscripts and deliver engaging on-topic copy. * Responsible for commissioning and project managing Square Peg’s cookery list. Pitching book ideas to sales and marketing teams, maintaining relationships with authors, selecting designers and photographers, managing freelancers, writing jacket and sales copy, and editing and proofreading manuscripts. * Ensuring that the entire food list is brought in on schedule and in budget by monitoring and managing junior and freelance project editors. * Responsible for project managing key titles in Phaidon’s food list. Liaising with authors, designers and photographers, and managing freelancers. Reporting to the editorial director. * Ensuring that titles are brought in on schedule and in budget by monitoring and managing freelance project editors, designers and project managers. 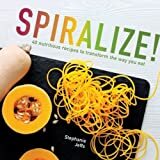 Spiralizing is a delicious alternative to making traditional noodles, pasta and rice; all of which are laden with refined carbohydrates. Swapping your carbs for veg with simply a few cranks of the spiralizer s handle is a quick and easy way to transform your meals into fibre-packed, low-calorie feasts. An in-depth guide to the best-ever games, exploring five decades of game evolution. It provides expert analysis of the story of each game, accompanied by fascinating trivia, memorable quotes, and information on the year of publication and where the game can be played today. Thanks for these kind words, Richard - it was a really great project to work on and I wish you every success with it.